Does Tom Selleck have the best mustache ever? Would a Magnum P.I. reboot with Magnum and his trusty sidekick Sloth be an awesome movie? Is Gus Cutty one of our favorite muralists? Asheville's Burial Beer Co. commissioned artist Gus Cutty to create a mural on their patio wall. But why Magnum & Sloth? According to Burial Beer Co., they were given a velvet Tom Selleck for their taproom. They were later given a a portrait of Sloth. Like a pop culture Reese's Peanut Butter Cup, the duo of sloth & Magnum just made sense. "Sometimes speaking the most important thing about yourself to the world means speaking about thing that makes you laugh and brings you joy without fail. 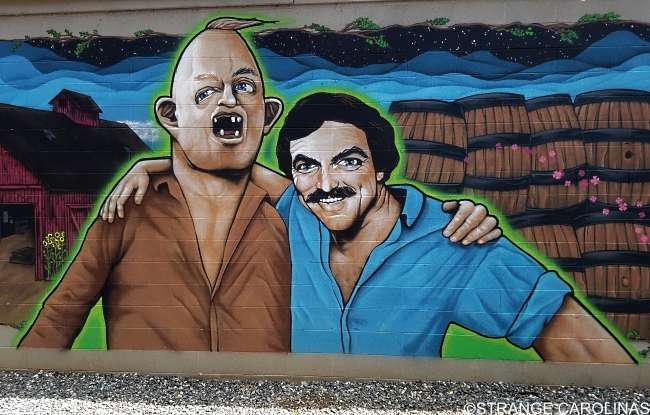 And sometimes that means your self portrait looks like a world where Sloth and Tom Selleck are best friends on an urban farm brewery nestled in the Blue Ridge mountains, just living their dream of being best buds."